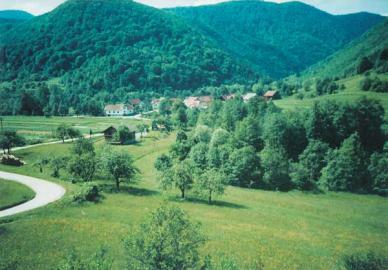 Lying beside the Kolpa River, the farm is surrounded by forests and meadows. The six-member Konda family were once millers but now they concentrate of producing cheese and other products from their home produced milk. Guests will therefore see a dairy next to the house along with the old sawmill, flourmill, and double kozolec (hayrack). The farm never runs out of dairy products and they are always fresh. Homemade salami is always on offer as well, since the Kondas themselves will tell you that they adapt their cooking to the desires and age of their guests They also bake many kinds of bread from the wheat grown on their farm. Activities on the farm are: hiking, cross-country skiing, horseback riding, table tennis, swimming in river / lake, bicycling, boating, children's playground and fishing. Als possible are horseback riding, bicycle rentals and rental of sports equipment. It is not far from the farm to Bilpa, a picturesque karst spring, and guests usually visit the Kozica viewpoint, the oldest still-operating blacksmith shop on the Kolpa River, the many remarkable churches along the river, and, of course, Kostel Castle.